Psycho has become an iconic film in the horror genre. Filmed on a low budget in black and white, it was a box office hit and resulted in two Academy Award nominations. Bates Motel and the famous shower scene are familiar around the world. This NextGen Gaming pokie makes great use of the shower scene. The five reels spin over the shower curtain, while edgy sound effects create an atmosphere of suspense. The main feature involves the knife – which can hack extra wild symbols onto the reels. Gamble Your Wins: Take a gamble after any win to 2x or 4x your profits. You’ll need three or more scatter symbols to trigger the free spins bonus games in this online pokie. These show a shadowy view of the Bates Motel. Three will get you 10 free spins, four wins 15 spins and you get the maximum 20 spins for five. There are also scatter prizes for two or more of the hotel symbols. There are two reasons this free spins bonus has big win potential. First, there are added wilds. These come with animations. One sees a shadowy figure appear behind the shower curtain (complete with a knife). The other involves the knife appearing in front of the reels. Both times you’ll hear edgy sound effects – and see extra wilds hacked into the reels. When those wilds appear, the part of the Bate’s Motel sign which says ‘vacancy’ in the base game comes into play. This will give a random win multiplier of between 2x and 20x for any wins those extra wild symbols give you. This would be a great time to have the high paying character symbols linked on the reels. You can retrigger for more spins (and more scatter prize) with three or more hotel symbols during this feature. 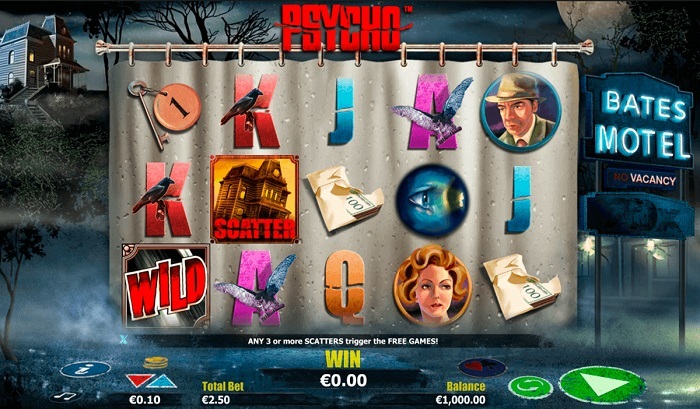 There are no extra on-reel features in the Psycho online slots. You do have the option to gamble after any win – a great way to potentially boost any smaller line hits. This is a simple game that appears over the reels. You can choose the colour or suit of a playing card for 2x or 4x boosts. While edgy and atmospheric, this is a simple pokie. The usual 5×3 reel setup is used, and the 25 win-lines are fixed. You can bet from 1c per line – or add a multiplier for bigger spins. Marion provides the biggest line wins. This unfortunate lady is worth 1,000 coins for five of a kind and pays all the way down to two from the left. Norman Bates also features. This symbol is worth 250 coins for the maximum five. Other higher paying symbols are an eye looking through a spy hole in a door, envelope full of cash and a room key with the number 1 on it. I’m sure fans of the movie will instantly recognise all of these images. Playing card symbols have been used for the smaller wins. All of these have been decorated to fit with the theme. For example, the ace has a bat flying over it and a raven accompanies the king. Psycho has a dark quality and excellent dramatic sound effects. The symbols spin over a shower curtain, with the flickering neon of the Bates Motel to the right. On the left, you can see the motel from a distance, with bare trees beyond. Things spring to life when you trigger the free spins bonus. The sudden appearance of the shadow with a knife behind the curtain is designed to make you jump. When the free spins end, you’ll see blood mixed with water circling a plug hole while your total is counted. Will NextGen’s Psycho Pokies Provide You an Envelope Full of Cash? NextGen have made the most of the dark and suspenseful theme with the Psycho pokies. This makes a refreshing change from the many bright and lighthearted games in their portfolio. While the base game is simple (only wilds and scatters), things spring suddenly to life in the bonus feature. With extra wilds literally hacked onto the reels, you’ll hit some big line prizes. These then get a multiplier of up to 20x.